The BP-60c is one of the best riveting tools out there, and works great whether you are using a rivet nut or a nutsert. However, to increase the tool’s longevity it is important to make sure you are using the right stroke for every job. If you have your tool set to the incorrect stroke, you could double stroke your tool which might break the mandrel. For those of you who have some questions about how to change the stroke on the BP-60c, here is an easy to follow guide. Ensure your anvil is set as close to the nose assembly as possible. In the low position, we have as many threads as possible showing. This is done by using your spanner wrench to loosen the lock nut, going to the lowest position, and putting the lock nut in place. Find the indicators on the top of the tool; this will tell you how many millimeters of stroke your riv nut tool is set to. Figure out what is the ideal stroke you need. (Most rivet nuts use between 1mm to 2mm of stroke.) Plug in your tool into an air source, and check the stroke. To adjust the stroke positively or negatively, place the spanner wrench on the adjustment groove and turn to your desired stroke. That’s it. If you remember these 4 easy steps, and take the time to make sure you have the right stroke for the job, your riveting tools will last for years to come. We have also filmed a video tutorial on how to change the stroke on your tool, for those who would like a more visual representation. Tools, especially those that are higher quality, can get quite expensive. You might only use it a few times, but those occasions could span a couple of years, so it is a good idea to get something that will last and that you will get better performance from. If you do it this way, you will be paying a little more so start by setting a budget and comparing prices first. If you are looking at ten years of use, paying a little extra is not so bad when you work out your return on an annual basis. Post questions on online forums if you can’t make your mind up between different brands and see if anyone has experience using the tools you are weighing up. Ask a salesperson who knows about different brands or someone who has worked with different models before. A heavier weight riv nut tool is a good indication of quality, so think about the force you will be applying and whether you can see it lasting for a decent period of time before you buy. If you are going to be using the tool for lots of jobs, or big jobs, it makes sense to invest in something that works quickly and efficiently. Tools that offer instant release are the quickest to use when there are lots of pieces of metal or there are bigger sheets that require greater reinforcement. If you are only going to be using your riv nut tool occasionally but will need to carry it around with you, a lighter weight option might be a better choice for you practically. This is especially true if you need to carry one in a tool box that is already heavy and full and where you will only be pulling the riv nut out every once in a while. Automatic rivet but tools usually have ergonomically designed handles to maximize comfort when using the tool. This makes it easier to use and minimizes your chances of developing blisters or calluses over the course of a few hours. It also provides an extra layer of safety, as a handle that is ergonomically designed is less likely to slip out of your grip when your hand gets sweaty. This provides swift and efficient power in a safe way. It is an ideal feature for smaller rivet nuts, as it provides controlled air pressure while you are working. Manual rivet nuts are usually more affordable, although someone who is less skilled may not be able to use it as easily as an automatic version. When comparing prices, make sure that you are also comparing like products and gauge what value you are getting for the money you spend. If you need a rivet nut tool for work purposes and will be using it often, a faster tool will accelerate the pace of your work. Make sure it is not faster and heavier though, because they may get difficult for you to manage as the day goes on. If you are going to be using the tool for extended periods of time, a lighter weight model will be easier for you to manage. Balance the weight off against the quality, because sometimes very lightweight tools are simply not strong enough to withstand prolonged or continuous use. While you want an advanced tool, something with more knobs and buttons than your computer is just going to confuse and probably be a waste of money. Let the person helping you know about your skill and experience level and make recommendations based on how much you are prepared to spend for your new tool. Currently on display at the National Museum of American History, an exhibit called America on the Move details how transportation and technology have changed the shape and fabric of America, from automotive to locomotive and beyond. The exhibit features everything from the trains and cars themselves, all the way down to the tools and techniques that saw these vehicles become a staple of our daily lives. Among this guide to the nation’s planes, trains, and automobiles, was a curious reminder of the lineage of our industry: A pneumatic rivet gun and three swages used on the railways and in welding work from 1950. From the 1920s, riveting tools have been crucial to the development of early automotives and locomotives, but this isn’t news to anyone. What is particularly interesting is just how far we’ve come in the last few decades. Comparing this artifact to the raw power and the sleek lightweight design of the BP-4V, for example, its impressive to see the improvements. From a two to three person operation, to a riveting gun wielding 3500lbs. of pulling force at a weight of only 3.6 lbs is a staggering leap in technological achievements, boasting the best weight-to-power ratio that the industry has yet to speak of. 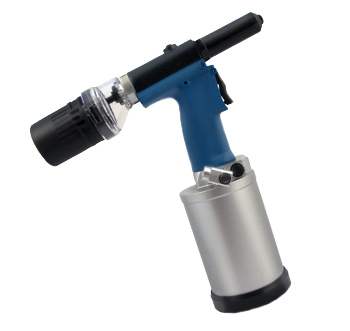 Our Power Micro boasts an even lighter weight gun that is still capable of 1760 lbs. of force, weighing in at less than 2.5 lbs. Far from the riveting relics of days past! Just Keep Making Cool Stuff With Rivets. Truck FUEL Tank Straps. Really gets how to make beautifully designed stainless steel truck accessories! How about this SS FUEL TANK STRAP!! !